Robert Leighton (1611 – 25 June 1684) was a Scottish prelate and scholar, best known as a church minister, Bishop of Dunblane, Archbishop of Glasgow, and Principal of the University of Edinburgh from 1653 to 1662. He was "noted for his Christian piety, his humility and gentleness, and his devotion to his calling"
Leighton saw good and bad in both the Episcopal and the English Puritan forms of worship. The Puritan Party gained such popularity that Leighton retired from the Ministry at Newbattle, citing the introduction of the Cromwellian ideas as to doctrine and ritual, as his main reason. Scotland's "Apostle of Peace", as he became known, took up the post at Edinburgh University as Principal for a period of 8 years, before being summoned to London, by Charles II, to be one of four Bishops appointed to look after the King's Northern realm in the Westminster Way. Hence his term at Dunblane as Bishop and subsequently at Glasgow as Archbishop. The grace of God in the heart of man is a tender plant in a strange unkindly soil; and therefore cannot well prosper and grow, without much care and pains, and that of a skilful hand, and one who has the art of cherishing it: for this reason God has given the constant ministry of the word to His Church, not only for the first work of conversion, but also for confirming and increasing His grace in the hearts of His children. And though the extraordinary ministers of the Gospel, the Apostles, had principally the former for their charge—the converting of unbelievers, Jews and Gentiles, and so the planting of Churches, to be after kept, and watered by others (as the Apostle intimates, 1 Cor. 3:6); yet did they not neglect the other work of strengthening the grace of God begun in the new converts of those times, both by revisiting them, and exhorting them in person, as they could, and by the supply of their writing to them when absent. And the benefit of this extends, (not by accident, but by the purpose and good providence of God,) to the Church of God in all succeeding ages. 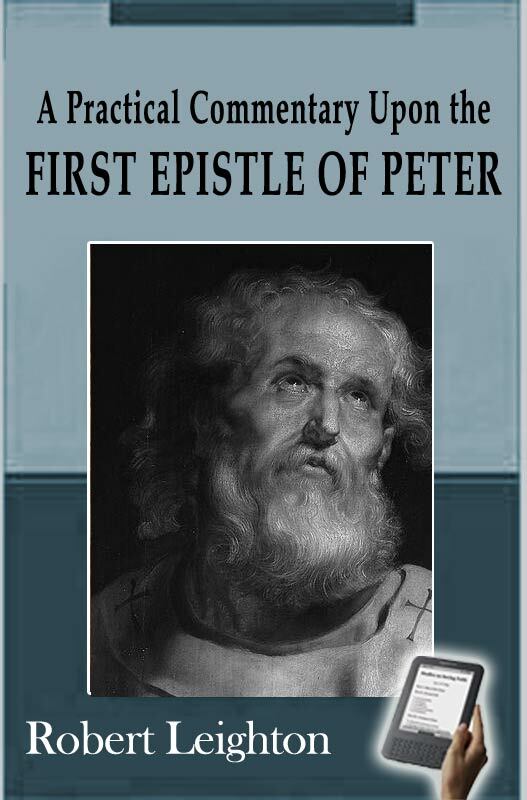 This excellent Epistle (full of Evangelical doctrine and Apostolic authority) is a brief, and yet very clear summary both of the consolations and instructions necessary for the encouragement and direction of a Christian on his journey to Heaven; elevating his thoughts and desires to that happiness, and strengthening him against all opposition along the way, both that of corruption within, and temptations and afflictions from without. The heads of doctrine contained in it are many, but the main that are most insisted on, are these three, faith, obedience, and patience; to establish them in believing, to direct them in doing, and to comfort them in suffering. And because the first is the groundwork and support of the other two, this first chapter is much occupied with persuading them of the truth of that mystery which they had received and did believe, viz. their redemption and salvation by Christ Jesus; that inheritance of immortality bought by His blood for them, and the evidence and stability of their right and title to it. And then he uses this belief, this assurance of the glory to come, as the great persuasive to the other two, both to holy obedience, and constant patience, since nothing can be too much either to forego or undergo, either to do or to suffer, for the attainment of that blessed state. And as from the consideration of that object and matter of the hope of believers, he encourages to patience, and exhorts to holiness in this chapter in general; so in the following chapters, he expresses more particularly both the universal and special duties of Christians, both in doing and suffering; often setting before those to whom he wrote the matchless example of the Lord Jesus and the greatness of their engagement to follow Him. Ver. 22. Love one another with a pure heart fervently. Ver. 10. But now have obtained mercy. Ver. 17. Honor all men. Ver. 18-20. when you do well, and suffer for it, you take it patiently, this is acceptable with God. Ver. 24. By whose stripes you were healed.